When teeth decay, your dentist will remove the decay in the teeth and fill in the void with metal or porcelain. Metal fillings are known as silver amalgam fillings. 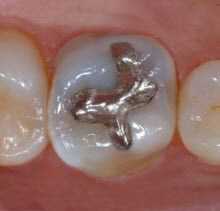 Silver amalgam fillings are made of a mix of silver, tin, zinc and copper. There are positives and negatives associated with using this type of filling. Durability – they last a minimum of 10 to 15 years and can easily outlast composite, or tooth colored, fillings. Strength – due to the sturdiness of metal, they can easily withstand the force of chewing. Expense – metal fillings are much less expensive than tooth colored options. Poor aesthetics – Silver fillings don’t match the color of your natural teeth so people can tell which of your teeth are filled when you open your mouth. 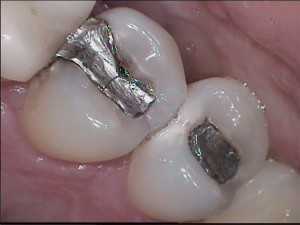 Destruction of the tooth structure – To fit the amalgam fillings, parts of the tooth that are healthy must be removed. Discoloration – After your tooth is filled, the metal can cause the remaining tooth to take on a grayish hue. Allergic reactions – A small percentage of people may develop an allergy to the mercury that is present in amalgam fillings. In the past few years, concerns have been raised as to the safety of silver-colored fillings. Amalgam fillings contain the toxic substance called mercury and some people think that the metal fillings are linked to diseases like autism, Alzheimer’s disease and multiple sclerosis. According to the American Dental Association and the FDA, there is no proof that silver amalgam fillings are harmful to your health. Likewise, there are no studies that show removing amalgam fillings cures any of these diseases. Dentists have been using these materials for more than 100 years and no evidence has been found to show they are dangerous. It is fairly common for a tooth to be sensitive to air, sweet foods or temperature after it is filled. The sensitivity usually goes away on its own after a few weeks. If it does not go away on its own, you may need to consult your dentist. It is not uncommon for people to experience pain when you bite. If your filling is interfering with your bite, you need to return to the dentist to have your filing reshaped. In order to maintain your fillings, you should practice good oral hygiene. Make sure you see your dentist for regular cleanings, brush with a fluoride toothpaste twice a day and floss at least once daily. If your dentist suspects that your filling is leaking, he will evaluate the tooth and replace the filling if necessary.